Just over ten years ago, I quit my day job. I was bored and unchallenged and bored and unchallenged and bored.... Selling motorhome windshields was not the life for me. Yes, there was a time when I lived and worked in the motorhome capital of the world. For me, being fulfilled in daily life includes your job...not just what you do outside of work. I can't fathom a work week in which I am unhappy. I'll admit, this doesn't necessarily equal fortune...at least not monetary fortune. But getting to indulge in your passion and practice what you love, not only at home, but in your work. I consider that the greatest fortune of all. So, with the notion of starting culinary school in a few short months, I decided to find a job in "the industry" while I was waiting. One chain and 9 dollars per hour less later...I found myself in the kitchen of an Olive Garden. I know, I know. Many of you are groaning. The Olive Garden!? I would never eat there. Well, that's okay. Even though they are a chain and you can see their daily special on the telly, I was working with food. That, in itself, put a skip in my step. Think that's unrealistic? That I'm a dreamer? Well, it's all a manner of perspective, I suppose. Live your life so that you're happy. That's all I'm saying. Cook the pasta in boiling, salted water until al dente. In the meantime, heat a large skillet w/ deep sides over medium heat. Add the sausage and cook until browned w/ crisp bits on the edges (that's how I like it, at least). Throw in the veggies, fennel, and crushed chiles. Sauté until the veggies just start to soften. Add the red sauce and bring to a simmer. The pasta should be just about done...ladle out a bit of the pasta cooking water and stir it into the sauce until you have a nice, saucy consistency. Drain the pasta and then dump it into the pan w/ the sauce. Toss. Serve hot with any of the garnishes. Sop up any sauce with garlic bread. Enjoy! Presto Pasta Nights is being hosted by Debbie at Debbie Does Dinner this week! When we go to Seattle I usually head to Olive Garden with the 45 other ladies. It is quick and consistent and I could eat buckets of their salad. I love anything with sausage! I love OG, it is a good restaurant and great for families. When we eat out as a family it is usually OG, and everyone is happy. Your offering of the pasta dish looks simply wonderful, and I can't wait to make it! THANKS! I've only been to Olive Garden once. It was good but I way tend to overeat when in the presence of that many carbs! So it has been avoided since. I love to do what you do and make it how I like it. Thanks for submitting to Presto Pasta Nights! Yummy....a good pasta dish always hits the spot. This is very nearly how I make sausage and peppers at home, and, ironically, that's on the menu this week since I just went to Little Italy for some hot salsiccia! You're picture is making my mouth water for it. Good thing we're having it tonight! We used to take our kids to Olive Garden all the time. We loved it! We were so disappointed when (years ago) they closed all of the Olive Garden restaurants in Ontario and replaced them with Red Lobster. Now we have to wait until we go to the States to get our Olive Garden fix. So no groaning here, I wish I could go more often! Your dish looks beautiful. Sausages and onions and peppers always go wonderfully together! I imagine it's the fennel that makes the dish. I have pasta planned for tomorrow. i might just make a stop for some sausage and peppers to try this out. At the very least, I'll be adding fennel to the sauce. this looks so yummy.. im going to make some for my husband tonight. thanks! This pasta looks great! I actually really like Olive Garden. When I get a craving I always get the same thing. The lasagna roll up things for an appetizer and then the soup and salad for dinner. I love love love that spicy sausage and potato soup. Sooooooo good. Delicious! You cook like an Italian! I feel like I know so much more about you...And the Olive Garden. Cool. Your dish looks wonderful. I love pasta bahted in plenty of red sauce and freshly grated parm. Yum! I worked in offices right up until I had my youngest and I disliked just about every minute of it. Money is most certainly NOT what makes the world go round and it certainly isn't what makes you happy. Amen! Garden and probably go at least once a year with my daughter (she's a total pastahead). This dish looks awesome to me! Are you sure it isn't one of Giada's recipes-LOL! I think it's awesome what you did and what you learned. Takes a lot of guts! And I will be commissioned for yet another fairy tale to be acted by young performers...and I always accept.It's in my field and I always learn something. I have done take-out of Olive garden's salad more times than I can remember. And you know that penne dish give my heart many happy-beats. I like Oive Garden, good food in my opinion. This dish looks so super good, thanks for sharing. I loooove penne pasta and sausage creations and have my own that is not nearly as delicious looking as yours. It is good to do what you love and makes you happy - everything else is so much easier then. 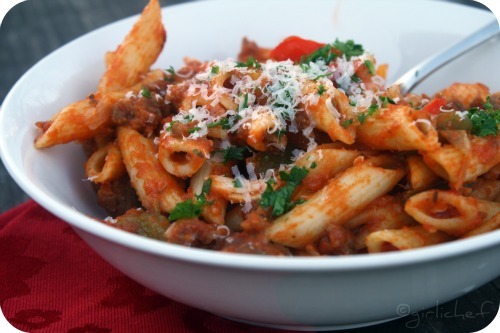 Penne w/Italian sausage is one of my favorite meals - it is, like you say so versatile! Am just drooling over that droolworthy penne.. 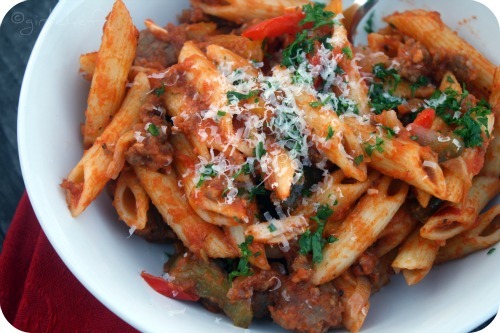 There seem to be some kind of chemistry among peppers, sausage and onions - they are a perfect match for pasta! how fun to have all of that food in the back of your mind. i like olive garden, it's one of my fave lunch spots. this is a gorgeous dish, it looks delicious! Great story and ... one of my very favorite easy to make pastas. Thanks for sharing both with Presto Pasta Nights. As to working your dream job... best thing ever! This sounds delectable - bookmarking it in my "recipes" favs. Thanks for posting! I digress, I love this dish; it's gorgeous, and I love that it uses peppers AND red sauce ... yum! Beautiful dish. I've eaten at the olive garden before and though it's not my FAVORITE place to eat, it's acceptable in a pinch. I am surprised to know that they make their own food though. And I am even more surprised to see that a variation of this is on their menu. Because it sounds fantastic! I make a dish very similar to yours and we love it. I frankly like going to OG and have always had great food there. The commercials on TV always make me want their new pasta dishes too. Oh...I'll tell you, I like Olive Garden and i have a knock off recipe for their Chicken Scamoi. To die for...really, it was great to learn more about your former life and I am loving what you said about Olive Garden. We don't eat out much anymore but when we did...we liked some of the healthier choics at O.G. Now your recipe here is a definite keeper. Looks wonderful! Girl...you have sold me...now I want to go and eat at Olive Garden again. I always loved those breadsticks! This pasta dish looks amazing! And I loved hearing about how you chose to follow your heart. Thank you for sharing, love. I hope you are having a relaxing Wednesday night! A very interesting inside into the kitchen of Olive Garden, thanks for sharing! The pasta looks terrific! Haha..we won't die but all the same, the post was great! First that all. That pasta dish looks delicioso! That is what I am cooking this weekend. I love fennel and tend to add a lot when making my own italian sausage. I think that is a great addition tot he dish. Thanks for the insider on OG. Yum! This looks amazingly delicious. The pictures are making my mouth water. You can't go wrong with sausage and peppers! Now I have a craving..
As it happens, I am making sausage & peppers for dinner tonight. You've just convinced me to toss some pasta through it! I think working in any large kitchen would be an eye opening experience. While chain restaurants are often looked down on, they often have perfected certain processes and techniques and then share that across the company. So you benefit from more learning experiences than you would working at a stand alone restaurant. I so totally agree that life is too short t to work at something other than what you love doing - this here ain't no dress rehearsal, so make the best of it, I believe. SPARTAN (Green & White) Chili ....Go State! Time to bake the Brioche! How 'bout throwing back a few SNOWBALLS with me? ¡¿Mi Caldo Verde está Rojo!? Hippie Rice w/ Tofu ...for this dirty hippie.